This cake may sound a bit odd when you read they ingredients but, it really is a perfect fun Spring recipe. A friend recently tried this Floridan/Ohioan Family’s 1950s recipe for her son’s birthday. It was a hit and quick to make. You might want to give it a try for your Bloomsday BBQ this weekend. Make one yellow cake mix according to directions in 13×9 pan. Cool at least 15 minutes. Poke cake all over with meat fork. Mix strawberry Jell-O with 1 1/2 cup boiling water. Add 8-9 oz strawberry pop. Pour over cake. Cool over night. Mix instant vanilla pudding mix with 1 cup milk. Fold in Cool Whip. Cover cake and keep refrigerated. Will serve 16- 20 people. 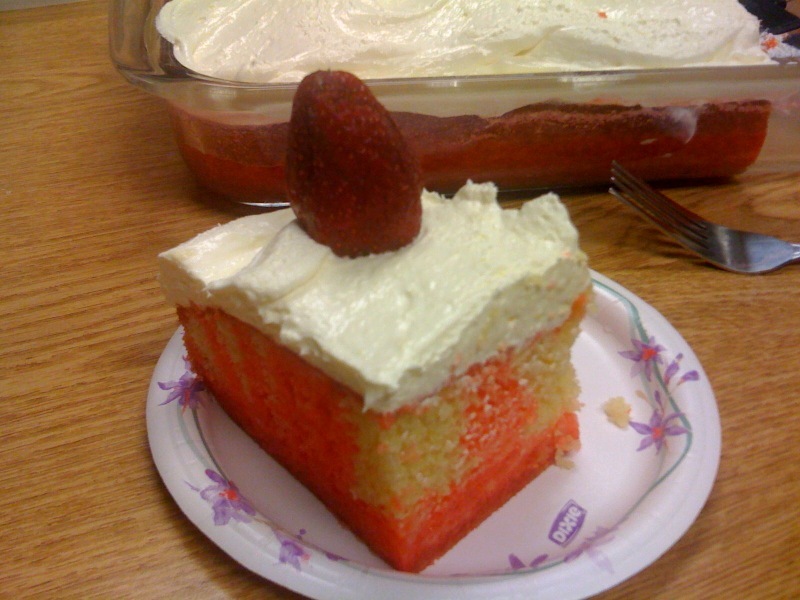 Do you recommend Strawberry Pop Cake? Make your voice heard!